OVERLAND PARK — For Karen Bonkiewicz, the path to a consecrated life was forged by family. “My parents are not rich,” she said. “They’re not well-known. They’re not the heads of companies or anything. Growing up, spending time together was the priority in her home. And sacrifices were made to ensure the children attended Catholic school. “I think my vocation took birth from going to Mass every day,” said Bonkiewicz. “That wasn’t my choice, but that’s what my school did and so that’s what I did. As early as third grade, Bonkiewicz felt God tugging at her heart. On Sept. 9, Bonkiewicz took her vows as a consecrated laywoman with the lay consecrated branch of the Apostles of the Interior Life (AVI) — a community dedicated to evangelization and helping people grow in their relationship with Jesus. Members of the Apostles’ lay consecrated branch profess their vows to Sister Susan Pieper, general superior of the AVI. As a consecrated laywoman, Bonkiewicz will continue to teach at Pius X High School in her hometown of Lincoln, Nebraska. She’ll also continue her formation with the AVI community through Skype, and by traveling to Kansas every few months for community events. By “rule of life,” Bonkiewicz means that she attends daily Mass, does a daily Holy Hour, a daily rosary, weekly confession and Divine Mercy chaplets. Within her Holy Hour, she spends 30 minutes in mental prayer. Bonkiewicz says she’s taking care of her soul so she can take care of other souls. And, as a high-school Spanish teacher, she has plenty of opportunity for that. “For many years now,” she said, “students just drop by my classroom all the time and they want to talk about a problem. “They feel comfortable talking to me, and I can get them to the right people for counseling. Bonkiewicz said her first encounter with the AVI Sisters, when she was a graduate student at the University of Kansas, had a great impact on her future. “I went to Mass [at the St. Lawrence Center]” she recalled. “And [the priest] said, ‘There’s going to be three Sisters coming from Italy.’ And I imagined them as old women in black habits. “The next week they came, and they were young, joyful — and not in habits. “And I was just blown away. Bonkiewicz entered the Marian Sisters of the Diocese of Lincoln, Nebraska, but, for health reasons, was not able to continue at the convent. She then learned about the lay consecrated Branch of the Apostles, which already had two members — Mary Grace Lasquety, a doctor in Chicago, and Renee Anne Paulin, a professor in Texas. “She began thinking seriously that this could be a way for her to live out a consecrated life,” said Sister Susan. “She could be the spouse of Christ and then continue her teaching, which she loves. Three years ago, Bonkiewicz started discerning to become a consecrated laywoman. First, she became a member of the AVI family group — lay Catholics who live the AVI charism of prayer and evangelization. “And then, I think it was two additional years of formation,” she said. In a note to family and friends invited to attend the celebration of her vows of consecration, Bonkiewicz explained the role of a consecrated laywoman. 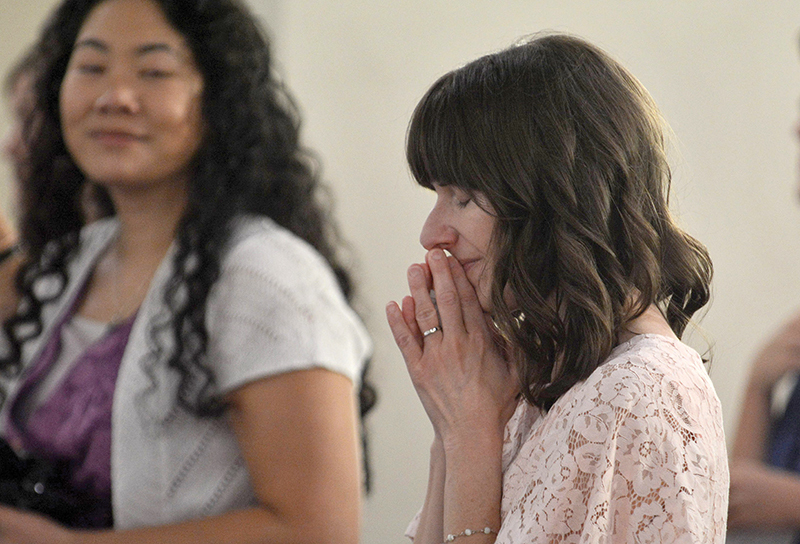 “She responds to the call of loving Christ with an undivided heart as his spouse,” she wrote. “She witnesses God’s love in and for the world. After the celebration of vows, Bonkiewicz admitted that, though she is quiet and reserved by nature, it was difficult for her to contain her joy. “I wanted to lift my arms to the sky,” she said. “I wanted to dance.